SAN DIEGO, July 31, 2009 -- Northrop Grumman Corporation (NYSE:NOC) has finished assembling the first Euro Hawk(r) unmanned aircraft system (UAS) for the German Ministry of Defence (MoD). With a wing span larger than a commercial airliner and endurance projected at up to 30 hours, the Euro Hawk(r) will serve as the German Air Force's high-altitude, long-endurance signals intelligence (SIGINT) system. The Euro Hawk(r) is a derivative of the Block 20 Global Hawk, and will be equipped with a new SIGINT mission system developed by EADS Defence & Security (DS). The SIGINT system provides standoff capability to detect electronic intelligence radar and communications intelligence emitters. EADS DS will also provide the ground stations that will receive and analyze the data from Euro Hawk(r) as part of an integrated system solution. "This on-time assembly of the Euro Hawk(r) demonstrator reinforces our commitment to providing ground-breaking technology to our customers and solidifies our transatlantic cooperation with Germany and EADS DS," said Jim Kohn, Northrop Grumman Euro Hawk(r) program director. "We're also on track for the Euro Hawk(r) unveiling later this year at our Palmdale, Calif. manufacturing facility after additional checkout and systems testing, followed by first flight and delivery in 2010 in Germany." Following successful testing and introduction in German operational service, Northrop Grumman anticipates subsequent systems will be delivered between 2016 and 2017. The Euro Hawk(r) will replace the aging fleet of Breguet Atlantic aircraft, which have been in service since 1972. "We're eager to receive the Euro Hawk(r) and can't wait to have this unmatched capability flying high above European skies at more than 60,000 feet and improving our troops' safety during military deployments," said Heiko Weiss, Euro Hawk program manager of the German Federal Office for Defence Technology and Procurement. "Developed to meet Germany's need for airborne wide-area surveillance and reconnaissance, this system will surely transform the region's situational awareness on land, air, and sea." "This collaborative effort between Northrop Grumman and EADS DS on this first Euro Hawk(r) is a great success and an excellent example of our transatlantic partnership," said Heinz-Juergen Rommel, chief executive officer of the EuroHawk GmbH. "We are excited to welcome this magnificent UAS here in Germany." 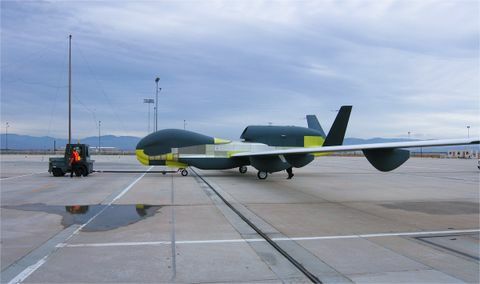 On Jan. 31, 2007, the German MoD awarded a $559 million contract to EuroHawk GmbH, a 50-50 joint venture company formed by Northrop Grumman and EADS, for the development, test and support of the Euro Hawk(r) unmanned SIGINT surveillance and reconnaissance system. Under the contract, EuroHawk GmbH will also provide aircraft modifications, mission control and launch and recovery ground segments, flight test and logistics support. EuroHawk GmbH is the national prime contractor for the German MoD through the entire lifecycle of the Euro Hawk(r) system. The limited liability company is based in Immenstaad, Germany.